“The bread-and-butter of profitability for Canadian banks — is going to have a little less butter on the bread," said Craig Fehr, investment strategist at Edward Jones & Co., whose firm oversees $30.8 billion in Canada. “That is, in many cases, the largest and most profitable and steady of the businesses that these banks operate." Vindication for those shorts appears some way off for now. The eight-member S&P/TSX Commercial Banks index has tread water for about two years. It gained about 3.3 per cent compared with a 0.8-per-cent increase in the S&P/TSX Composite Index and a 4.4-per-cent gain in the U.S. KBW Bank Index. Toronto-Dominion Bank’s (TD.TO) Teri Currie, who oversees the domestic banking division at Canada’s largest bank by assets, expects "mid-single digit" growth this year in residential secured lending, which includes amortizing home-equity credit lines and mortgages. Investor David Baskin, whose Baskin Wealth Management oversees $1.2 billion, said he’d rather banks focus on wealth management. “I’m not looking for the banks to grow their mortgage business," he said. “I don’t think that’s where the juice is." 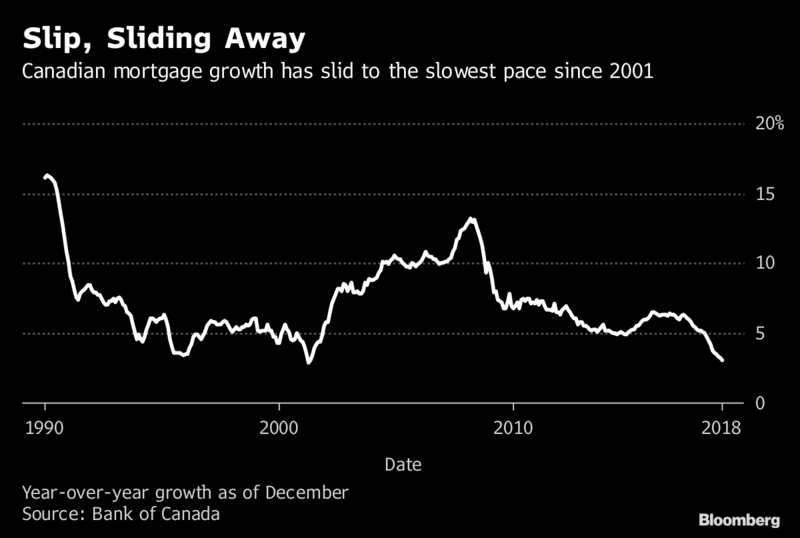 Steve Belisle, a Montreal-based portfolio manager with Manulife Asset Management who helps oversee about $7.5 billion, said the banks are countering the slowdown in residential lending with growth in business loans — something that makes Belisle a bit uneasy. Canada’s six biggest banks had an 11-per-cent jump in commercial lending last year. “The overall loan growth for the banks is actually steady — it has been around 4.5 per cent — and that’s because they are offsetting the slowdown in mortgages with commercial lending, which is low double digits," Belisle said. “That’s adding risk at the peak of the economic cycle."